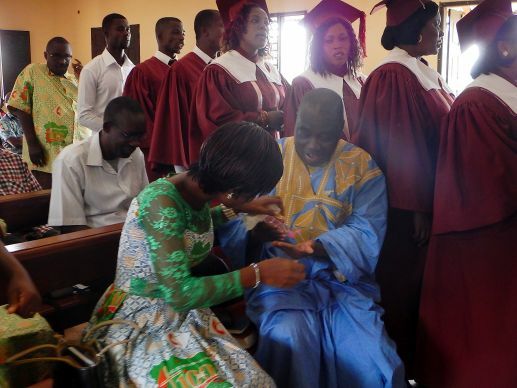 United Methodist preacher, Victor Gnangbi, and Claudia N’Guessan use hand sanitizer before communion at a United Methodist church in western Côte d’Ivoire. Though no cases of the deadly Ebola virus have been reported in Côte d’Ivoire, the threat stalks the western part of the country, which shares borders with Liberia, Guinea and Mali. “Our borders are not walls with doors where we can prevent someone from entering or leaving," said Dr. Simplice Adouko, ACONDA-VS HIV coordinator for the region. ACONDA-VS is a health care organization primarily dedicated to fighting HIV-AIDS. "Information is the first remedy against Ebola," Adouko said. "It is important to communicate about this disease, to raise awareness of the real threat of Ebola." "Some still behave like St. Thomas. They want to see a case before believing," he added. Dr. Dagnogo Levolotchin, government departmental health director for Côte d’Ivoire, said no Ebola cases have been suspected or reported in the country. But the cities of Sipilou, Zouan-Hounien and Danané are in the Tonkpi region, which shares borders with Liberia and Guinea – often natural borders. For instance, it is just a short walk from Danané to Liberia. Even though borders are closed, goods from neighboring countries can still be found in the markets. Man is the capital of the Tonkpi region. The strategic position of Man, its mountains and its economic attractiveness, makes it a trade center for the region. The city draws people mainly from Guinea, Mali, Burkina Faso and Liberia. Most shop owners are nationals from these countries. "We have quite the same affluence during market days like when the borders were not closed,” said Sidiki Traoré, a resident of the region who served as a guide. The downtown market, the largest in the region, swarms with people. Motorcycles, mainly imported from Guinea, can make driving difficult, according to a wôro-wôro driver. A wôro-wôro is a local taxi with a regular line and fixed price. All along the main avenue are stores with bikes, motorcycles and tricycles, as well as second-hand clothing, and fuel or palm oil cans. "These are all products imported from neighboring Guinea," Traoré says. Villagers are asked to report any suspicious person, but there are numerous trails throughout the vast expanse of forest that cannot all be monitored. "It's God's grace that we are spared so far," said Armel Goni, a nurse. Authorities take the threat of Ebola seriously. Jérôme Soro, the regional prefect (government official) heads a regional committee established in March to raise awareness about the virus and safety measures. New governmental decrees prohibit hunting and marketing of bush meat, also called wild or game meat. Eating bush meat is one way people have gotten Ebola. Victor Diby Gnangbi, secretary general of Man Prefecture (city), is chairman of a second committee. “From the first signs of the disease, we conducted awareness. We invited people to abandon their old habits of hunting and eating bush meats and adopt health and safety measures,” Gnangbi said. Man’s committee meets weekly to assess the situation. The committee consists of the prefectural, health, military authorities and non-governmental organizations involved in the fight. "NGOs working with health centers are aware of the difficulties and are taking all measures to help them," said Dr. Christian Agoli, a World Health Organization consultant. According to WHO, the number of infections in West Africa has topped 17,000, with more than 6,000 deaths. Several international organizations, such as the United Nations Office for the Coordination of Humanitarian Affairs, International Rescue Committee, ACONDA VS and Save the Children, are involved in the fight to keep Ebola out of Man. Recently, the organizations gave three ambulances to Mapleu, Danané and Binhounien localities. They also supported 10 health centers, 10 primary schools and a secondary school with 6,000 students, distributing basic equipment such as gloves, bibs and hand-washing supplies. The National Institute for Public Health has trained police and provided them with laser thermometers and protective equipment. Soro praised the work of the organizations, but said coordination is needed to make sure equipment is distributed fairly. The only hospital where Ebola cases could be referred in the area is in Man. Poor roads and scarce transportation would make such referrals difficult, Adouko said. Gnangbi, who is also a United Methodist preacher, expressed regrets about the limited resources of the church. "I am sorry that the church is not sufficiently equipped and prepared to help families of potential victims," he said. The border closings have presented difficulties for people on each side. Fanta Souaré, 12, was accepted for secondary school, and went to share the good news with her grandparents in N’Zérékoré, Guinea, during the school holidays. Now, she cannot return to her parents and school friends of Ecole Primaire Publique Peraldi 6 because the border with Guinea was closed to prevent the spread of Ebola. Many families from Man who have relatives across borders lost contact with them. “After school resumed in October, we lost contacts with some students,” said Callixte Gnagne, a teacher at Peraldi 6. Closing the border with Guinea has hurt trade, especially transportation and the food business. At the entrance of restaurant N'Dalié-Espoir, a bucket for washing hands welcomes visitors. Inside, a waitress hands customers a hand-cleaning gel before taking their order. The cook says bush meat, popular with Ivorians, has been removed from the menu. "Since the Ebola crisis, we do not have enough customers. Our turnover fell by 50 percent," says Traoré Ismaël. Adouko deplored the lack of resources allocated to communication about Ebola. When the outbreak began, the 2014 budget for ACONDA-VS had already been approved and distributed, so there was no money left when the Ebola outbreak happened. “So we are trying to tighten between lines to generate funding to inject in the fight against Ebola," he said. His NGO works mainly in the field of HIV, but their donors asked them to get involved in the fight against Ebola. "Our primary mission is to protect medical personnel, then the population," he said. Gnangbi said the church must “play a role of a rouser of conscience and social mobilization." The Rev. Roland N'Guessan, superintendent of the Man Missionary District, said information is distributed in vernacular languages and French. "We use all possible opportunities and avenues including services and meetings to get out messages about modes of contamination and hygiene measures," N’Guessan said.